With a distinct lack of strikers in any strikerless formation, by default you are going to rely on the movement of your midfield players to score goals. Earlier, I mentioned the importance of Verticality in this regard. Today, I want to focus on the importance of overloading the opposition in certain areas. Please keep in mind that overloads are far more complex than simply the overlapping of a full-back to create a 2 vs. 1 situation in wide areas. Overloading is a potentially powerful weapon, which can be achieved by both formations as well as team instructions. Unfortunately, it often takes many months for teams to adjust to this particular playing style, mostly because of the tactical familiarity and team cohesion required to pull this off. It is essential that the players within the team are able to create unpredictable overloads all over the pitch through their own movement (away from the desired tactical shape). As you can see, the attacking midfield trio is clustered closely together, which automatically gives them a numerical advantage against most opponents. They then look to overload central areas to facilitate building up from the back and through the thirds. With a lack of forwards, outnumbered in the final third when the opposition is prepared, this then means that the trio looks to play in between the lines in the final third and that the remainder of the team should look to break forward to support. The emphasis is very much placed on positioning. So far, we’ve mentioned the basic offensive movement as decribed in earlier articles. However, there is also the often overlooked aspect of overloading the middle third to achieve a better build-up from the back. Usually, these movements are made by wing-backs moving forward to overload the middle third, but such an overload could also be achieved by the defensive midfielder pushing on forward. It is generally quite effective to find that long flat ball along the ground into one of the players occupying the middle third. Having the formation set up wide generally creates space somewhere on the pitch. There are several options available in such a scenario. In this option, the opposing side has dropped deep. To prevent us from overloading the defence, the entire midfield has dropped back to from almost a back 8. This means that our half-back has a lot of space and time on the ball. Whilst his back is towards the opposition, which makes him prone to pressuring, most opponents are quite far away or facing the wrong way. There are also realistic passing options out wide to continue the build-up. The second scenario shows us an opponent with a more ballsy approach. The defence has pushed up to close down the midfield trio. By default, that means their entire team pushes forward further. With the opposing forwards taking up a position higher up the pitch, the half-back drops back to provide cover, eliminating the central passing option. However, where one options disappears, a new one opens up. The wing-backs are wide open and able to pass it to a midfielder before moving further forward to start a new attack. In both solutions you are able to build up play from the back due to overloads and this build up is often from central areas. In the scenario where the build-up starts from a wide area, the ball is quickly transferred to a central player, who was more passing options available to him. With all the movement this tactic facilitates, passing options always open up. In an offensive sense, in the final third, your key players are the central attacking midfielders. The movement and positioning of the attacking midfielders opens up space in the heart of the defence. By playing in the gap between midfield and defence, they are either always open to receive a pass, or they drag the defensive line higher up the pitch, thus creating space for movement into the space behind the opposing defensive line. In the example above, the overloading takes place in midfield. The #9 Kadir Kurt is the Targetganche, who has dropped back, where was the intended recipient of his pass is our Central Winger, taking up a position further up the pitch, meanwhile being left unmarked by the defender, who has opted to track the run made by Kurt. You can also see that both our wing-backs are left wide open, they can offer a similar threat when overloading. The right wing-back has overloaded the defensive zone and is now wide open to cross the ball into the box. In the central area, there are a bunch of our players lurking, waiting to pounce. I generally opt for the low cross, driven in hard towards the first post. It’s difficult to defend against and with a lot of mobile players, there’s a decent chance someone will run onto it. If you do opt for floated crosses, a cross towards the far post could lead to goals, as the opposition always forgets to mark the on-rushing wing-back at the far post. Very nice read again Guido. Hi, may I ask you if the mental, physical og tactical qualities are the most important in developing av team able to execute this in proper fashion? I’d say mental qualities are slightly more important than the other two. The Very Fluid style means people have to be able to read the game and position themselves accordingly. 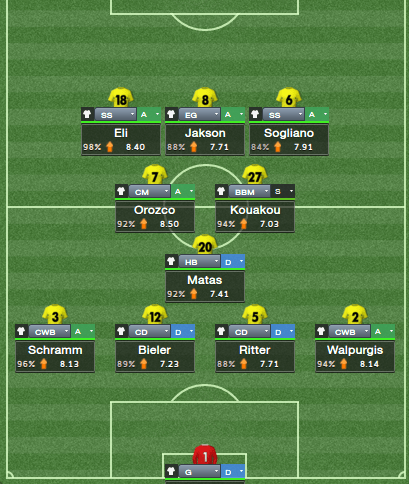 Hi, do you have a download link for this tactic please?